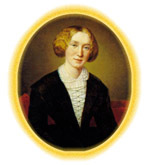 In paying tribute to George Eliot today we acknowledge a debt of gratitude owed to her for the legacy of wonderful novels which have enriched so many lives during both the nineteenth and twentieth centuries. As we approach the twenty-first century I find myself considering how her work will be greeted by the coming generations, indeed not just in a new century but in a new millenium. In the early part of this century, the Bloomsbury writer Virginia Woolf helped restore George Eliot's standing as a great novelist by claiming that Middlemarch was one of the few novels for grown-up people, and throughout the second half of the century George Eliot's work has featured in the halls of learning, both in school curricula and university degree courses, not only in a literary sense but also as a valuable secondary source in the areas of nineteenth century religion and philosophy. More recently we have seen George Eliot brought to the fore by the very twentieth-century phenomenon of television. Some of the adaptations may not have achieved full justice for the novels but even if only a few more people have been encouraged to read her books then we can view this medium as a successful way of promoting her work. Perhaps more successful adaptations have been achieved by fringe theatre groups in recent years. We have seen very worthy productions of Adam Bede, The Mill on the Floss and Silas Mamer and the benefit of fringe theatre is that it can reach a much wider audience than mainstream theatre by offering cheaper tickets and more accessible venues. This therefore encourages a younger audience who may already be studying her work.